KTIA has an excellent lobbying team and the management team focuses a great deal of time and attention on advocacy. However, the essential ingredient in KTIA’s advocacy success is grassroots involvement by its members. There are numerous ways in which that involvement can occur and the association works very hard to equip members with information, strategies and tools to enable that involvement to occur. Described below information and a tool kit for use by members. As new resources are developed they will be added. Please make every effort to be engaged in and do your part to protect and further the interests and issues of Kentucky’s travel and tourism industry. No other strategy can match the results that individuals meeting with legislators can deliver. It is a must for KTIA members to meet with legislators in-district and hopefully on-site at a travel industry location. Although the best approach is for constituents to reach out to legislators with the invitation, if KTIA can assist with scheduling, please let us know. A link to a detailed legislator meeting "how-to" document is available below in the toolkit. Do not be concerned by the document's length as we opted to provide ample detail for your use. The toolkit also includes a leave behind document for legislators. Speaking Opportunities - Rotary, Kiwanis, Lions, Women’s clubs and most importantly Chambers of Commerce represent excellent opportunities to tell tourism’s local and statewide stories and to reach legislators, local officials and business leaders with our message. Local CVBs should take the lead on contacting these organizations and attempt to schedule speaking opportunities. KTIA’s President & CEO is available to make these presentations as his schedule permits. Local tourism directors and other key local tourism leaders should also make themselves available. Op-Eds & Letters to Editors (LTE) – KTIA has developed a general op-ed for members to submit to local newspapers. The op-ed can be pared down to be used as an LTE. “Stunts” – Consider actions that can be taken that will draw local attention to the importance of tourism. For example, can a local attraction offer admission for $14.50 during a week to highlight the $14.5 billion tourism economic impact? Or maybe attractions or other tourism service providers offer a 14.5% discount. Publicity surrounding these actions and resulting stories will garner attention. KTIA carries out a robust social media plan aimed to continually press our tourism message in the public domain. This effort is being pushed through our KTIA Twitter (@KyKTIA) and Facebook (@kytravelindustryassoc) accounts. Members who have not done so should begin following KTIA on both platforms and re-tweet and share KTIA messages. Additionally, we encourage all members to integrate local information and use similar messaging on their respective accounts to further drive home these points. Download this two-sided document that summarizes the economic importance of tourism and provides information about tourism funding. This is designed for use as a leave-behind for legislators. 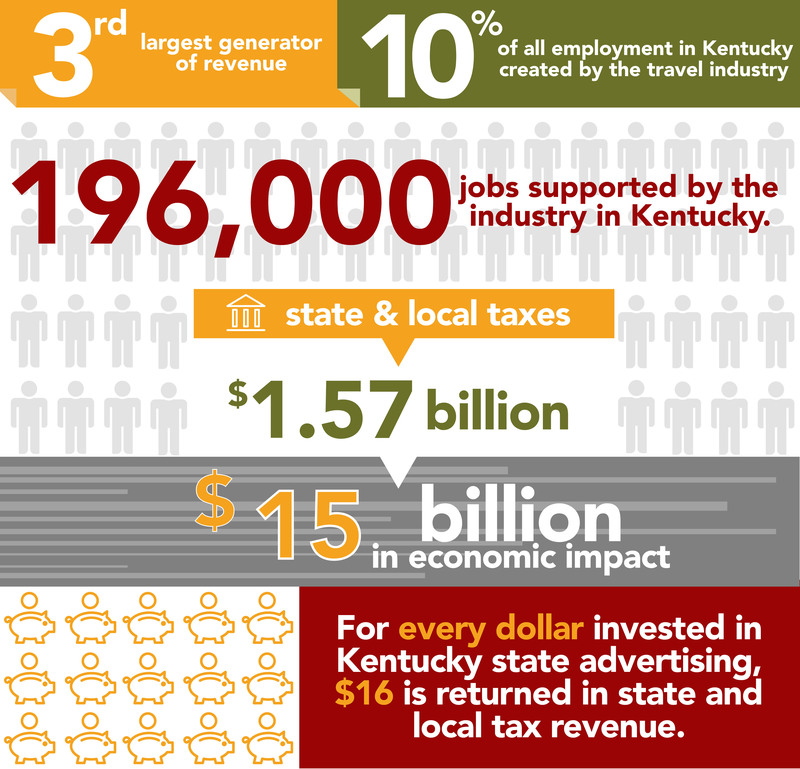 Tourism info graph for use in developing signage, posters and other material to convey the importance of Kentucky tourism. One of the most effective ways to convey our message to legislators is for them to hear from businesses in their districts that benefit from tourism, and that point to their CVB as an important partner in their business success. CVBs should distribute this sample letter to relevant businesses and organizations and request that it be sent by them to their legislators.